The mystery of silence is fully experienced in the life of Orthodox Monasticism. Away from the noise, the distractions of the world, and the din of crass consumerism, the Orthodox monk turns his hear to a different voice—best heard—and even expressed, in silence. The atmosphere, the air itself, and the monks of an Orthodox Monastery…convey a wordless language that no tongue or speech could ever express. The power of this silent language is especially borne by Holy Elders who from generation to generation pass on their charismata—their gifts—on to their disciples. This is true even today just as much as it was in the past. In a remote cave toward the middle of the 20th Century, atop the impassable cliffs of Mount Athos, Elder Joseph the Hesychast perfected unceasing interior prayer, known as The Jesus Prayer. It is said of Elder Joseph that when visitors came to him for counsel he already knew not only their names but their innermost thoughts as well. In time, a group of disciples gathered around Elder Joseph at the Skete of Little St. Anne’s, all of whom would carry on the Tradition of Holy Orthodox Eldership. One disciple, Elder Ephraim of Katounakia of Mount Athos, who reposed at the turn of the 21st Century, was so filled with the power of Eldership that his eyes alone could pierce through the very core of one’s soul and thereby transmit divine healing. Another disciple, still alive today, also named Ephraim, after 12 years under Elder Joseph, later received a vision to establish Monastic Communities across North America, now centered at St. Anthony’s in Arizona. Elder Ephraim, after years of also perfecting the stillness of The Jesus Prayer, possesses the gift of bearing within himself silent grace…and the gift of transmitting this grace to all that come to him…by virtue of his mere presence alone. Now, one should visit Orthodox Monasteries, not so much to ‘see something interesting,’ but rather to be raised to new realms of consciousness through the mystery of monastic silence. The Entrances, Harbors and Gates of Orthodox Monasteries; the Soundless Figures of Monks going about their various tasks; the Bell Towers, Courtyards, Chapels, and Churches; Rituals and Processions; the Pathways, Stairways, Balconies and Porches – all bring the visitor through new doorways of interior awareness. “There’s a time to speak and a time to be silent,” the Scriptures tell us. It is in silence that one can hear the inner promptings of one’s own voice…as well…as the voice of God Himself. Financial Concerns To Continue these Videos and my Ministry have REACHED a Critical State. Once again I find myself having to dig into my own personal finances to stay online and maintain my public ministry. I am now in a week-to-week STRUGGLE to bring in contributions and I think this is why I have been feeling so drained lately. Hits are moving up to the 10 million range since starting Real Jew News. THE VIDEOS since starting in July of 2010 are moving into the 3 million viewing range. BUT ONLY A FRACTION of the viewers and readers contribute to my ministry. MANY who have supported me in the past have stopped altogether. AND MANY who make promises to me to help financially (I have had SO MANY disappointments that if I were too sensitive about this I would have given up a long time ago) NEVER keep them. Soo - If this Video (one every week along with at least one Article, this Website, this Comments Section, and the Ministry I am trying to conduct is IMPORTANT to you and you wish to SEE ME CONTINUE then please consider helping financially. This video reminds me of my piglrimages to the Holy Mountain, the first one in 1979. Thank you, dear Brother, for so an inspiring contribution. May God have mercy on us all. If I had one wish, it would be for our western brethren to know more of the original and holy tradition of the Christian Church, still alive today in Orthodox countries and places, perhaps most important of which is Mt. Athos. In relationship with your appeal: I think most people are scared to appear as donors to your Foundation. They, as I do, sincerely love you, and are really grateful for your brave work, but… they fear the consequences of appearing as your financial supporters for the reasons you day by day shows us: the “counter-party” is very powerful and “who knows what could happen if my name is made public…”. I think you, being born a Jew are not scared, you know the situation from inside, and furthermore being now a monk, you have not reasons to be afraid, whereas we have families and responsibilities towards others. Please forgive my frankness, but it’s only because I really appreciate what you are doing in order to keep us aware. You thank me for “keeping people aware”… yet you tell me that most people are scared to donate to my Foundation. I can only “keep people aware” by financial contributions. Pretty cut and dry don’t you think? People write to me all the time telling me how much they love the Videos and the Articles. I have given my little financial contribution, today too - the amount I can afford - and I will do my best to continue. I was not writing about my fear which I don’t feel. I was just trying to understand the obstacles on your precious effort. Since the topic is out there, how much is it that you need every month to stay afloat? Some people may feel sending only a couple bucks won’t help, I have felt this way. So let’s say only 50 people sent you money every month how much would each need to send? I know more is always better, but I’m talking about the bare minimum. Help us help you and give it to us straight. I am totally drained and about to turn off my computer. These videos take multiple hours of research, preparation, filming, very expensive editing and technical help to produce. If everyone just gave $1.00 who view these videos and read my articles, I would never have to ask for money again. I think by stating this you may see a lot more dollar bills in your mail box. Now people have no excuses. And neither do I. Just stunning presentation, dear +Brother Nathanael, and a nice change from news from the evil world of Jewry. The grace of Christ in the Holy Elders certainly shines through. Elder Joseph is one of my favorite elders, and I believe you honor him with this video. It also occurred to me from the various pictures of the monasteries and the artistic way that you arranged them, that true Orthodox monasticism is primitive in the best sense, or rather timeless. It is so visually ‘organic’ in that many of the structures are integrated into God’s material creation, yet extending into the spiritual and holy at the same time by following sacred geometry, architecture and art, but doing only just enough at the same time. Old World monasticism is very different from the modern Western understanding of monasticism and style of monasteries, which often seem more like comfortable seminaries than monasteries anymore. Anyway, God bless, and thank you for this precious glimpse of holiness and otherworldliness, especially appropriate for these last days of Lent. A message of peace and hope in times of society’s chaos. Thank you Brother Nathanael! If you sit down and really think hard about what you have described then you quickly realize that there is no choice BUT to contribute. If people are scared to speak with their pocket books due to fears of association, that means our freedoms and liberty are gone and we are already down the river with no paddle. If you are willing to accept serfdom for you and your generations, then don’t contribute. I do not speak so forcefully, nor do I have the vast knowledge necessary to produce such an awesome website as this one…But I still can do something…I can support those I know who DO have the skills and tools. I am not rich, neither am I poor. I can contribute a little, each week, steadily. If enough were steady, there would be no problem. Think about the rare jewel you have before you…someone who has grown up in the teachings and traditions of the Jews who has accepted Christ and became a lay Orthodox Monk! What kind of knowledge must that man have! Rare knowledge useful in the battle against evil. You seem like someone with knowledge about the Orthodox Church. I find the Church more interesting by the day. Where would be good starting materials to learn more about the Church? Thank you for your confidence and kind words. However, I’ve been Orthodox for many years now after conversion and baptism about 15 years ago, but I still feel like I’m just beginning, and taking baby steps still! I come from an Episcopalian/Presbyterian background and upbringing, then was “unchurched” for way too many years! There are numerous Orthodox websites. The first place I would suggest is Father Alexander’s site at http://www.fatheralexander.org/. He is with the Russian Orthodox Church Outside Russia (ROCOR). “Welcome to the OCIC Web site, one of the largest and oldest sites on Orthodox Christianity. “Think of the OCIC as a vast online article repository, with over 700 articles and 6,000 printed pages. “This site has been online since 1996 and receives over 36,000 unique visitors per month, according to Google Analytics. This page leads to further links with frank, but irenic discussion about the denominational issues and various aspects of Western Christianity from the Orthodox point of view. There you will find suggested reading links, such as the book ‘The Orthodox Church’ by Kallistos Ware, which gives a good, concentrated historical survey of the Church from the time of Christ and the Apostles, a summary of where things are now, and a fairly even-handed look at the Schism of 1054 between the East and the West. The second part of his book comprehensively covers the liturgical, sacramental life of Holy Tradition of the Orthodox Church. Another site, Orthodox Photos, is much more than the website title would indicate, with very insightful, instructional articles about the Faith. Also, Gracie (she and her husband are about to be baptized into the Orthodox Church in a couple of weeks) posted a list of books on March 1 that could also be useful for you. I hope this helps to get you started, and may Christ bless and protect you as you start this journey. There is a deep spiritual calm that accompanies the sincere repetition of The Jesus Prayer. There is incredible power in that prayer for those who have accepted the Master’s call or those or sincerely are seeking to. As I have mentioned here previously, I live in a part of the country that is dominated by Talmudized Baptist and other protestant churches. The kosher commandos who attend them are trained poodles who attack anyone who dares attempts to enlighten them on the crimes of the synagogue of Satan, the holohoax industry, or the vicious assaults on Christ The Redeemer and true Christians. I continue to dodge many bullets at work just for encouraging others to think for themselves and to do their own serious research. I ask for spiritual protection daily and receive it from Christ and His heavenly agents. I have contributed to Brother Nathanael for a long time now as I believe Christ is scanning the globe for a remnant of men and women willing to shed their cowardice by stepping forward and offering support for the select few who boldly proclaim the truth in the name of Jesus Our Holy Savior. Please continue to keep me and my family in your many prayers, Brother Nathanael. Rest assured that I continue to pray for your protection and well being. Those of us who believe in constitutional government, the Bill of Rights, personal liberty, and State autonomy are beginning to taste what German theologian Dietrich Bonhoeffer and pastor Martin Niemoller experienced back in 1930’s Germany. These two great lovers of God and freedom were ostracized and eventually persecuted by both Germany’s political and social societies and by “German Christians.” History does have a way of repeating itself, doesn’t it? Thank you, KathJuliane, for taking time to provide much information. I remember Gracie’s post and info as well. I find the information shared by individuals in the comments to be of great value. It takes me some time to pour over the links and information in the posts and comments, so I know how much work those who write the articles and post comments put into this labor of love!! 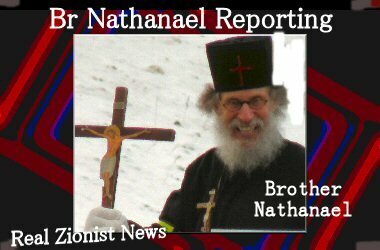 Thanks again Brother Nathanael for another fine article and thanks again to the commentators on this site. I appreciate the learning experience I’m getting here from all of you. He’s a “Judeo-Christian”… if you know what I mean. I came across an article about him (I’ll search for it if need be) that points out his allegiance to the “Israel” in the M.E. I believe Pastor Baldwin, along with the majority of Pastors, Ministers, Priests, “Fathers,” Sunday School Teachers, etc., etc.,… are victims of purposeful and deceitful false teachings and false interpretations of Scripture that has been going on for centuries by the Judaics with their ongoing attack on Christianity. I believe Pastor Baldwin along with all of the “Judeo-Christians” of this country and of the rest of this world have been indoctrinated with, not the Truth, but with lies. I believe the majority of Christiandom over the centuries were not “wise as serpents and harmless as doves” and have been victims of “wolves in sheep’s clothing” lies. OHHHHHHH THIS, THIS, ‘THIS’ is what I LONG FOR. I am weeping for JOY, gentlemen, for as a woman of GOD (and quite an expressive one, at that) I have learned a bit of this silence, in a very small way. When I came to South Australia, I had NO idea (as high as the Heavens are above the earth-kinda thing, you understand) what challenges and growth would provoke my (willful) spirit of ’self.’ Praise YAH, He knew that much better than I. In the winter (which is coming on now, actually) I’d wake at 3am - frozen in my bed - as our wood burning fireplace was precious low on its needed fuel to warm the limestone home. I’d ‘almost’ SCREAM in my discontent: “I AGREED TO MOVE TO AUSTRALIA - BUT, I ‘DIDNT’ AGREE TO MOVE BACK INTO THE 1930′S!!! !” And, on and on my diatribe went, I almost became ’shrew-like’, believe me. It took only 2 years of ‘winters’ to get my Americanized Complacent Rump outta bed so that I’d pad to kettle (we drink instant coffee out here - but, that’s another story), turn it on, pad outside to fetch a few pieces of wood, and then, sit - in Holy Reverence, it eventually became, merely listening to our Father - rather than talking to Him incessantly about my fleshly need. Today - I wait in JOY and ANTICIPATION for our weather to dip once again - so, I may sit at the open hearth (with my little Auggie Doggie and little kitten, Tiger - who now accompany me at my JOY), and, lift up my heart in silent praise to our GOD and KING and soon coming ONE. Dearest Brother, is there a place, anyplace in this world beyond my fireplace - where women of GOD may sit in the reverence of silence? And, I am not only ‘willing to finally commit to financial support’ without placing the funds in our dear Brother’s hands, which I attempted to do just a few months ago. But, I shall go to prayer about it right now and even with my scant funds, I will make a pledge. *It’s HIGH TIME that not ONLY Brother Nathanael pursues his CALLING without his brothers and sisters ‘coming along side’ not only in the esoteric, Spiritual Realm - but, in the area of hard, cold CASH which is needed for him to continue to bless us. I, for one, stand and come forward — having NO FEAR. Many believe that Orthodoxy is one of the many “churches” around. Namely one viewpoint of Christianity, or others believe that Orthodoxy is a religion. Both these viewpoints are absolutely FALSE. Orthodoxy basically means TRUE glory or true faith. She is not one of the “churches” because she is the ONLY true Church of Christ. This naturally is not pride but the TRUTH. Since the Lord instituted only one Church, how can we speak of many? Moreover, Orthodoxy cannot be called a religion because a religion is superstition, it (every religion) tries to cover the psychological needs of man. In contrast Orthodoxy heals the spiritually ailing man (meaning every man) and renders him holy, this being the tangible and obvious proof of her truth. This is a good reminder by Brother Nathanael to me, we need to stay in the Lord for this fight. It is impossible to defeat them any other way, as our Good Shepherd has said of them “…you are of your father, the devil it is his will that you do..”. These Jews are still working for their father Satan and they stand in his power with their sorcery and spell casting and demon invoking black magic. We must put on the full armour of God and take up our prayer weapons against them. What we achieve by prayer in the heavenlies will be made manifest on earth we have to over-throw the principalities and powers of the air in the name of the Lord Jesus Christ. This enemy knows that the more sin, filthy lifestyles, greed, wickedness and blasphemy it can promote and produce through the film and media industry they own, the more they can separate us from God’s power and bring his judgement on us and increase their satanic hold on us with sorcery. I will now sing you all one of my favourite songs, reminding us to stay with the Good Shepard. Thank you for providing the link to your Gospel site. I ended a hard day with a smile and joyful heart thanks to your beautiful voice and precious songs. Are you THE Jim Reeves? My husband said I should check up on THE Jim Reeves since he remembered something about a plane crash that ended his life back in the 1960’s. Interesting article. I wish more people, especially the politicians and media shills, would go into monastic silence. I need to ask a question of this informed audience that demands an answer and I apologize if it’s a teeny bit off-topic but it’s a short, simple one. It’s well known that the Tribe traces their luciferian ancestry through their mothers as it is regularly smeared into our Goyim faces. But the Bible I’ve read, both Old and New Testament, going back to the beginning, makes it clear that the patriarchal lines are the legitimate basis of ancestry. We are Sons of Abraham, not Sarah. What gives? Obviously a Talmudist lie and irrelevant to a true Seed of Abraham, which has nothing to do with the Tribe. Are “Christians” really this stupid? Are Jews this stupid? Or is it that they never bother to read the Word of God? I think it’s the latter. We already know that Jews are evil and constantly lie. I have listened to your song and it’s pleasant and soothing. It would seem that this choice of yours puts your recent comment “…I hear the sound of distant drums pum pum pum…. pum pum pum, sorry my timing is out…” into some kind of better context, the circle is closed. Ah well, it was probably the South African wine, as you have suggested yourself. But the Chinese circle remains wide open, yet it is always good when a circle closes, for there’s just too many shills around the place. Y’day I was trying to listen to a Wilcock interview of three hours, but stopped after about an hour, when I realised that he was talking for that length without either he or his guest saying anything except peddling the Fulford agenda of some indefinable cabal organisation, which has of course nothing to do with the lovely race of the Jews. Now come on, Jimmy, give yourself a push and tell me that having spent one hour on this provides unequivocal evidence that I am a bit slow on the uptake! Since you have now been promoted to the real Jim Reeves you would surely be fully qualified to do so! Let’s inject a bit of life into the final parts of the silence discussion, which albeit, surely has its own merits, which regretfully and all too easily seems to evade unspiritual ignoramusses like myself! Being aware of my own shortcomings at all times I would, in closing, send my best regards to dear Bro Nat, whose invaluable work on all fronts is one of the few inspirations left! Hopefully, God willing, I will get a chance to visit St. Anthony’s one day. Ostensibly, Talmudic law was formulated to preserve the race from rapes by Goys of Jew women. Sometime during the Roman occupation and the Second Temple period, a law of matrilineal descent, which defined a Jew as someone with a Jewish mother, was adopted by the Rabbinate. By the 2nd century CE, it was clearly practiced. The Talmud (Kiddushin 68b), which was compiled in the 4th and 5th centuries and committed to writing the traditional Oral Law, explains that the law of matrilineal descent derived from the OT or Written Law. The passage (Deut. 7:3-4) reads: “Thy daughter thou shalt not give to his son, nor shalt thou take his daughter to thy son. For they will turn away thy son from following me, that they may serve other gods,” even though the original law only prohibited intermarriage between the specifically listed tribes of Deut 7:1 and Israel. Otherwise, conversions of any foreign men or women were provided for in the Law of Moses, subject to certain conditions. Some scholars believe that this new law of matrilineal descent was enacted in response to intermarriage. Others say that the frequent cases of Jewish women being raped by non-Jews led to the law; how could a raped Jewish woman’s child be considered non-Jewish by the Jewish community in which he or she would be raised? Some believe that the matrilineal principle was borrowed from Roman law. There were intermarriages between Romans and Romanized Jews, or convert Judaic Romans or God-fearers and Jews. Other than as a possible Rabbinic polemic against the geneology of Jesus Christ and the four Gentile women converts who were His ancestors listed on the pedigree, about the only non-scriptural kind of case law that I can recall which might vaguely relate to the later rulings of matrilinial descent, would be laws concerning the first-born sons of each wife in polygamous marriages, or from re-marriages after divorce or widowhood as separate considerations from the rights and inheritances of the very first-born son of the father. Ha ha ha ha the real Jim Reeves is resting on that Golden Shore, I hope, poor chap. At least he left us his lovely music, like that other great country singer Patsy Cline who also died in a plane crash. Hello Wotan, I know what you mean. These Shabus Goys wafling about Bilderberg, Jesuits, Catholics, Banksters but none of them will say the Jew word. Notice how these fake truthers will also avoid speaking of Freemasons because that is too close to the bone for comfort. I seem to find another windbag like Alex Jones or David Icke under every stone, or rather click of the mouse. Don’t be too hard on yourself, we have all been deceived at one time or another, I’m sure I’m still deceived on many things I just don’t know it yet, maybe at the right time the Lord will reveal them to me. As you say Brother Nathanael is rare gem indeed. He has practically dedicated his life to unmasking these criminals and imposters who dare to call themselves God’s Chosen People. It is for this reason that we have support him as much as we can every cent helps when it all adds up, let’s give what we can to contribute to God’s true work. May God grant them mercy to wake up when they hear Brother Nathanael’s words of truth. You have moved me and educated me very much. I live in poverty, but still I will copy your address and mail you a tiny bit of support. I can not thank you enough for your dedication and patriotism..You indeed are a very rare human being. I will now shut off this machine and pray to God that your readers send you one dollar or two. Brother Nathaneal, I must say the Lord has answered my prayers before with much greatness and gusto. I must go now to my prayer room and pray for you, for your strength to go on with this HARD work. Let me know if my prayer works. It sure couldnt hurt.